What happens when a new technology is so precise that it operates on a scale beyond our characterization capabilities? For example, the lasers used at INRS produce ultrashort pulses in the femtosecond range (10 exp -15 s) that are far too short to visualize. Although some measurements are possible, nothing beats a clear image, says INRS professor and ultrafast imaging specialist Jinyang Liang. He and his colleagues, led by Caltech's Lihong Wang, have developed what they call T-CUP: the world's fastest camera, capable of capturing ten trillion (10 exp 13) frames per second (Fig. 1). This new camera literally makes it possible to freeze time to see phenomena–and even light!–in extremely slow motion. 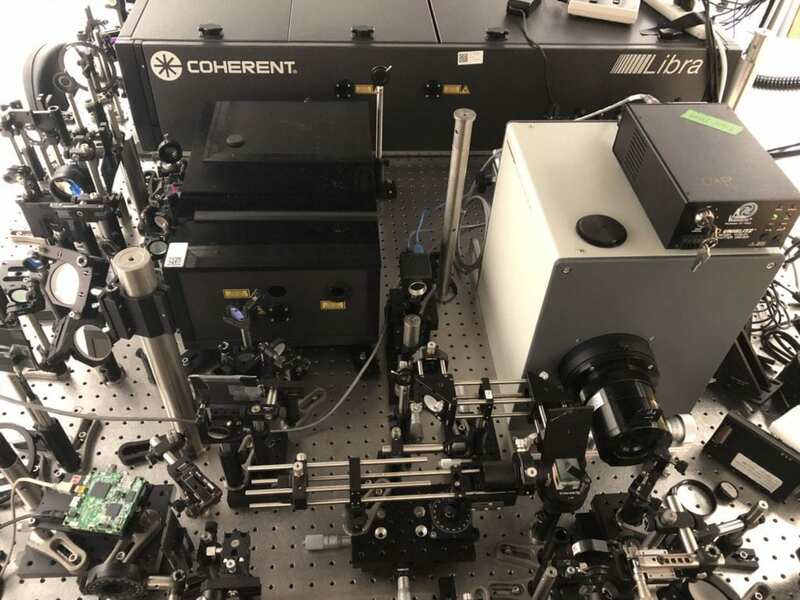 The first time it was used, the ultrafast camera broke new ground by capturing the temporal focusing of a single femtosecond laser pulse in real time (Fig. 2). This process was recorded in 25 frames taken at an interval of 400 femtoseconds and detailed the light pulse's shape, intensity, and angle of inclination. "It's an achievement in itself," says Jinyang Liang, the leading author of this work, who was an engineer in COIL when the research was conducted, "but we already see possibilities for increasing the speed to up to one quadrillion (10 exp 15) frames per second!" Speeds like that are sure to offer insight into as-yet undetectable secrets of the interactions between light and matter. "Single-shot Real-time Femtosecond Imaging of Temporal Focusing", Jinyang Liang, Liren Zhu, and Lihong V. Wang, Light: Science & Applications 7, 42 (2018). "Single-shot ultrafast optical imaging", Jinyang Liang and Lihong V. Wang Optica 5(9), 1113-1127 (2018).